The game of Russian roulette being played with the U.S. federal debt has been called a “grotesque political carnival” and political blackmail. The uproar stems from a statute that is unique to the United States and never did make much sense. First passed in 1917 and revised multiple times since, it imposes a dollar limit on the federal debt. What doesn’t make sense is that the same Congress that voted on the statute votes on the budget, which periodically exceeds the limit, requiring the statute to be revised. The debt ceiling has been raised 74 times since 1962, 10 of them since 2001. The most recent increase, to $14.294 trillion by H.J.Res. 45, was signed into law on February 12, 2010. Taxes aren’t collected until after the annual budget is passed, so Congress can’t know in advance whether or how much additional borrowing will be required. Inevitably, there will be some years that the budget pushes the debt over the limit, requiring new legislation. And inevitably, now that this tactic has been discovered, there will be a costly battle over the increase, wasting congressional time, destabilizing markets, and rattling faith in the American financial and political systems. There will be continual blackmail, arm-twisting and concessions. The situation is untenable and cries out for a definitive resolution. Ignoring the debt ceiling on Constitutional grounds would not, as Michelle Bachmann declares, make President Obama a “dictator.” It would simply mean he is complying with his Constitutional mandate to pay the government’s bills on time and in full. Social Security Is Not Welfare. It Is a Debt Due and Owing. The Fourteenth Amendment says debts already incurred shall not be questioned, “including debts incurred for payment of pensions.” That includes Social Security, which is an “entitlement” in the true sense of the word: we’re entitled to it because we’ve already paid for it. In fact, the Social Security Act was originally sold to Congress and the nation in 1935 not as a government benefit, but as a retirement savings program. Earlier this year, the Urban Institute published a study evaluating the program in this way, concluding that the average worker who retires today will withdraw from Social Security just about the same amount he put in over the years, with a modest 2% real interest rate (after inflation). A deal is a deal. We paid for it, we are owed it, and the U.S. government is good for it. To change the terms of the deal ex post facto is both a breach of contract and a violation of the Constitution. In the last year or two the Fed has been buying up U.S. Treasury bonds in an effort to lower interest rates and boost the economy. The most recent round of that buying has been dubbed QE2, and has come under a good deal of criticism, though most economists agree that it was a generally helpful policy. The result is that the Fed now holds nearly $1.7 trillion in U.S. debt. But that is really phony debt. The Treasury pays the interest on the debt on behalf of the U.S. government to the Fed, which in turn returns 90 percent of the payments it gets back to the Treasury. Nonetheless, that $1.7 trillion in U.S. bonds that the Fed owns, despite the shell game of payments, is still counted in the debt ceiling number, which caps that amount of total federal debt at $14.3 trillion. Paul’s plan: Get the Fed and the Treasury to rip up that debt. It’s fake debt anyway. And the Fed is legally allowed to return the debt to the Treasury to be destroyed. A trillion and a half dollars is currently about what spending is expected to exceed tax revenue in 2011. The biggest drawback to the plan, says Gandel, is just that it “looks bad.” It looks as if the government is paying off its debts by printing money. But that is what government-issued money is: a note acknowledging a debt due and owed from the public, good for an equivalent value from the public, traded in the marketplace. A U.S. Note or Greenback and a Federal Reserve Note or dollar bill are both forms of promissory notes. The government can as easily issue a dollar bill as a dollar note or a dollar bond, as Thomas Edison pointed out in the 1920s. 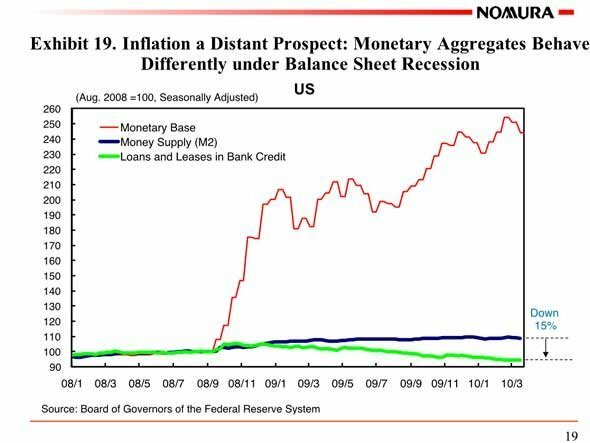 Misdirected Fed policy has instead caused $1.6 trillion in “excess reserves” to sit on bank balance sheets, as explained in an earlier article. Conveniently, excess reserves can be used as collateral for futures and derivatives contracts, and that is what some banks appear to be doing with the money: backing trades in the financial markets. This sort of speculation, involving money making money without increasing productivity, can and does drive up prices. If the money had been delivered directly to the government to be spent on the national budget, it might have gotten into the real economy where it could do some good. The government’s budget is spent not on speculation but on goods and services. Increased government “demand” stimulates an increase in “supply,” causing supply and demand to increase together, avoiding price inflation while stimulating economic activity. The debt crisis was created, not by a social safety net bought and paid for by the taxpayers, but by a banking system taken over by Wall Street gamblers. The gamblers lost their bets and were bailed out at the expense of the taxpayers; and if anyone should be held to account, it is these gamblers. The debt ceiling crisis is a manufactured one, engineered to extort concessions that will lock the middle class in debt peonage for decades to come. Congress is empowered by the Constitution to issue the money it needs to pay its debts. Abraham Lincoln did it; Barack Obama could do it. He probably won’t, but he does need to follow his Constitutional mandate to pay the government’s bills as and when due. The statute imposing a ceiling on the national debt is trumped by the Fourteenth Amendment, making it redundant and unnecessary. The statute should be repealed. Ellen Brown is an attorney and president of the Public Banking Institute, http://PublicBankingInstitute.org. In Web of Debt, her latest of eleven books, she shows how the power to create money has been usurped from the people, and how we can get it back. Her websites are http://webofdebt.com and http://ellenbrown.com.